At age 90, Vermont’s first quadruple murderer died a free man in 2007. 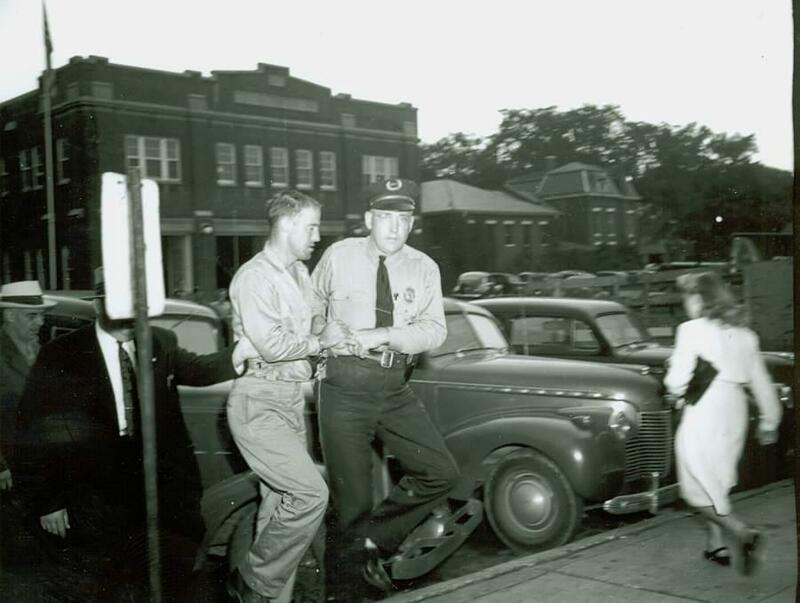 He had lived most of his life within a five minute walk from VSP headquarters. In colder weather he was often seen on his frequent walks wearing an old surplus VSP parka from the 1970s. Although an entire family had been brutally murdered, in the long term, it seems in this case that the system had actually worked. The Bliss Mansfield house as it appeared when police arrived on the day the murders were discovered. 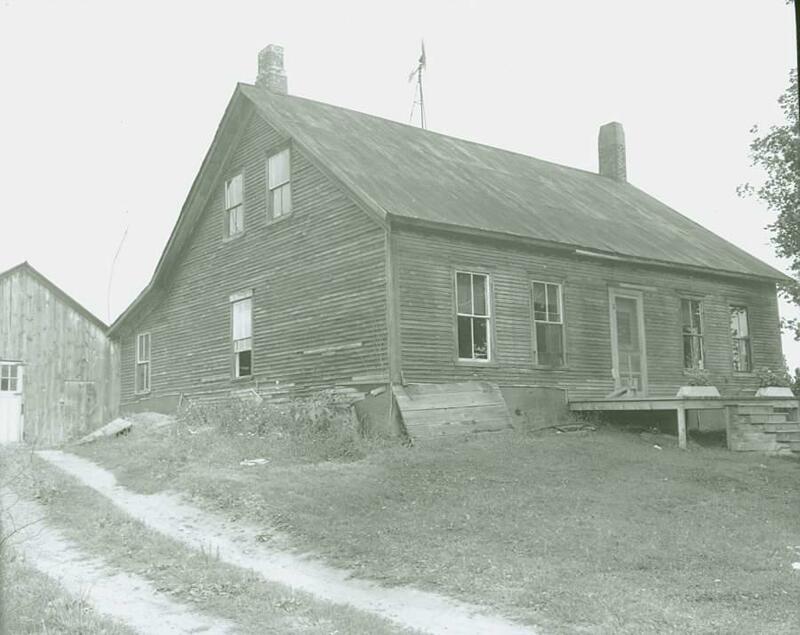 The same house still stands and has changed little since 1945. Bernard Romprey (29) came home on an emergency furlough from the Army after his father’s farm in Essex Center burned on August 13, 1945. While home, Romprey and Ernest Randall (15) spent some time target practicing. According to a later statement by State’s Attorney Clarke Gravel, “Romprey had acted most peculiarly the last days of his furlough. He consulted a physician about what he called his neurotic condition and was advised to see Army doctors for help.” This had been a very loud and very clear cry for help that was missed with tragic consequences. On Tuesday afternoon, August 28, 1945 Private Romprey boarded a train along with his wife and two children to return to duty at Camp Wheeler, Georgia. While waiting for the train, Romprey had a seemingly normal conversation with the Essex police chief. En route back to base, the Rompreys planned to enjoy a quick stop over in Englewood, NJ to visit the parents of young Randall with whom he had gone shooting a few days earlier. The next morning Randall noticed the cows at the Bliss Mansfield farm still in the field and laundry on the clothes line long after it should have been taken down. Somewhat later, Rollie Veaudry, a neighborhood youngster, noticed the same thing and around 1:30 went to the farm in Essex Center where he found the house locked and cats crying to be let out. When his knocks went unanswered, Veaudry jimmied a window and entered the eerily silent home. In the kitchen he found Marion R. Mansfield (28) dead on the floor in a large pool of blood. She had apparently been facing a cupboard when killed by a single shot to the left rear of her head. The sugar bowl that she had been holding lay shattered on the floor. Marion was Bernard Romprey’s sister-in-law. Law enforcement officials meet in the kitchen of the Mansfield house. 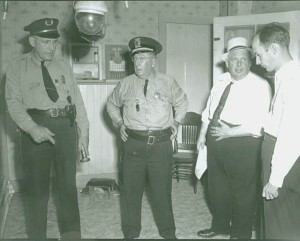 Left to right: Essex Chief Clarence McCloud, Winooski Chief Charlie Barber, Chittenden County Sherriff Dewey Perry and State’s Attorney Clarke Gravel. While on Army duty, Romprey had previously sought help from both an officer and a chaplain. He stated that he couldn’t remember doing things and felt unable to explain some of his own actions. It remains unclear what, if anything, had been done by military officials. 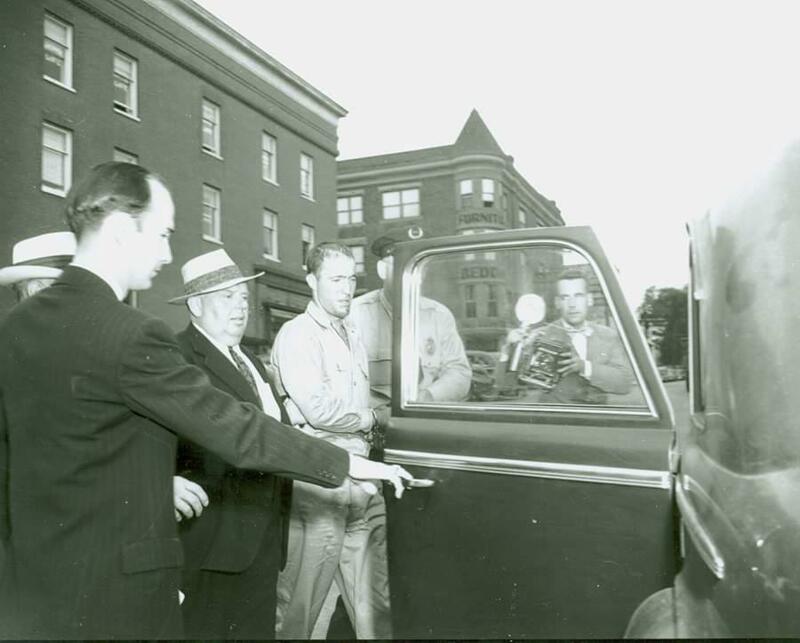 After the discovery of Marion’s body and in the early afternoon of Tuesday, Essex Police Chief Clarence McCloud arrived on scene along with Winooski Police Chief Charlie Barber and Chittenden County Sheriff Dewey Perry. State’s Attorney Gravel also arrived during the afternoon. A search was begun for the rest of the family. Although Marion appeared to have been ambushed in her kitchen, evidence indicated that her husband Bliss Mansfield (31) had been run down and shot in the head from behind in a garden just to the north of the house. Chief McCloud looks into the feed bin at the rear of the horse barn. It is here where the bodies of the children were found. Romprey was immediately suspected and arrested on Wednesday in Englewood, NJ. States Attorney Gravel and Sheriff Perry left to bring Romprey back to Vermont where they were met by Almo G. Franzoni – later the chief detective for the early VSP. During this and on all subsequent days, Romprey proved to be mentally unstable. There was little disagreement in law enforcement that Romprey was deeply troubled and convincingly denied remembering any of the shootings. He was fearful, crying and repeatedly turned to officers to protect him – at one point turning his tearful face into the shoulder of Essex Chief McCloud for protection. Sent to the Vermont State Hospital, he was institutionalized. Over the next years of professional care Romprey learned jewelry and watch repair. After 17 years, he was released in 1962 and he set up a small and successful jewelry store on South Main Street in Waterbury. He proved to be fully rehabilitated and lived a long, peaceful, and productive life as a full member of society. There is universal agreement with his friends and neighbors that the rest of his life was lived as an honorable citizen. Bliss, Marion, Faye and Richard Mansfield are all buried in Essex Center. Their farm house still stands in Essex Center with few exterior changes. Two days before their funeral, Chief McCloud drove Romprey’s father to the Vermont State Hospital after he had collapsed. The father had twice been committed previously. 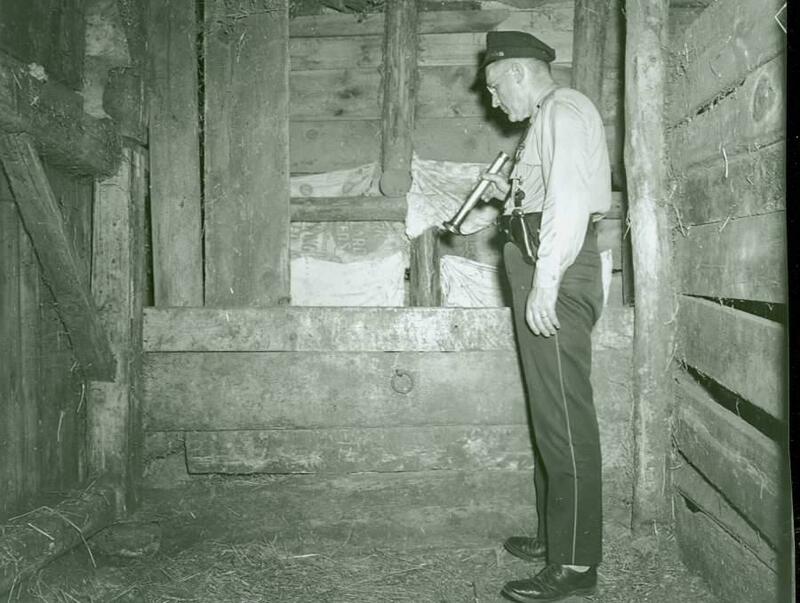 The horse barn where Faye and Richard were killed has long since vanished – as have all police files related to this case.